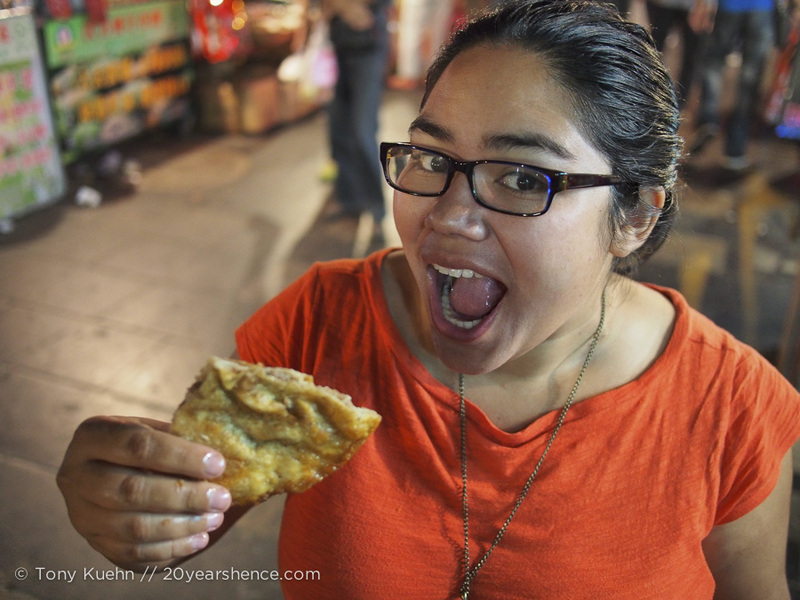 Normally we are huge fans of street food and dining curbside, but while we were in Hong Kong, our friends shared some disturbing stories about street-food-related deaths in China that spooked us. Two weeks was about the amount of time it took us before we got fed up with paying over the odds at sit-down restaurants for mediocre food, threw caution to the wind, and finally started eating at street stalls. All I can say is: better late than never. 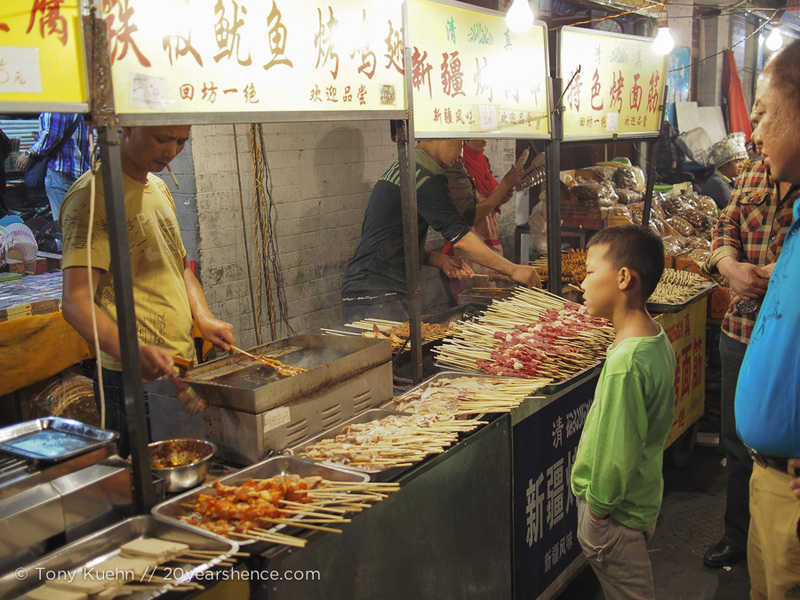 Without a doubt, there is no better place in Xi’an to chow down than its Muslim quarter. Because we were only in the city for 2 nights, we only got to visit once, but what a visit it was! Located just behind the Drum Tower, the Muslim quarter is focused on North Guanji Street and the cramped alleys that branch out from it. Best experienced at night, the street is strewn with garish and gaudy lights, which perfectly accent the upbeat energy that buzzes through the area. It’s completely over the top, yet it never felt tacky. The trinkets and jewelry for sale are far more likely to sparkle than the cutlery, and the streets pulse with a gentle chaos, but nothing about the area is slovenly or decrepit. Instead, it simply felt abundantly alive, exactly the way we thought Asia would feel. 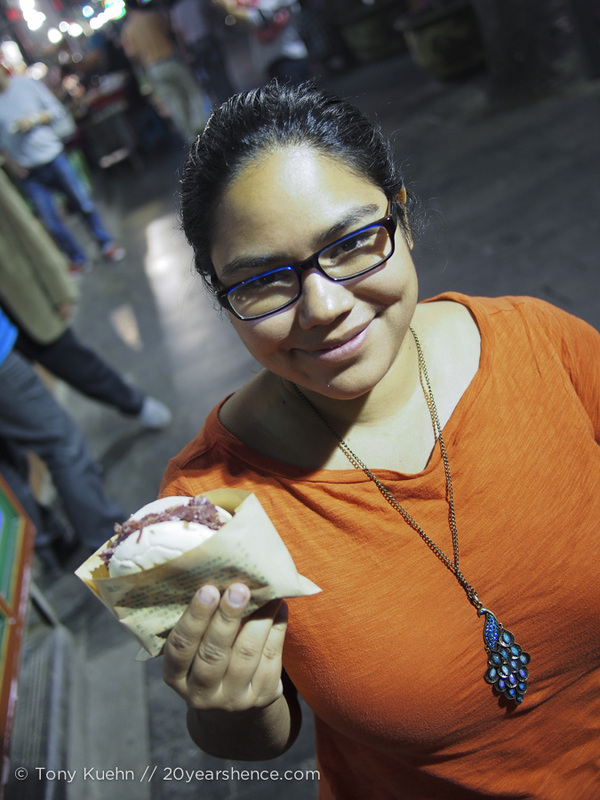 While there, we tucked into some specialities for which the Muslim segment of Xi’an is well known, which included a delicious mystery meat sandwich (we want to say it was beef — it tasted like corned beef! — though our internet sleuthing suggests it was in fact pork… which seems just wrong given the religious dietary restrictions of most people working in this area) as well as an even more delicious flatbread/meat stuffed pancake. 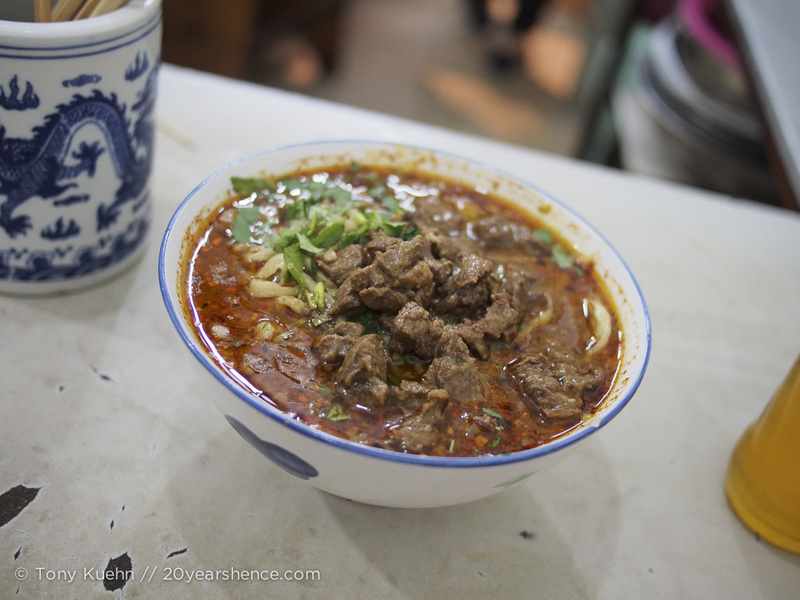 But probably the standout meal that we had here was a big bowl of spicy lamb soup. 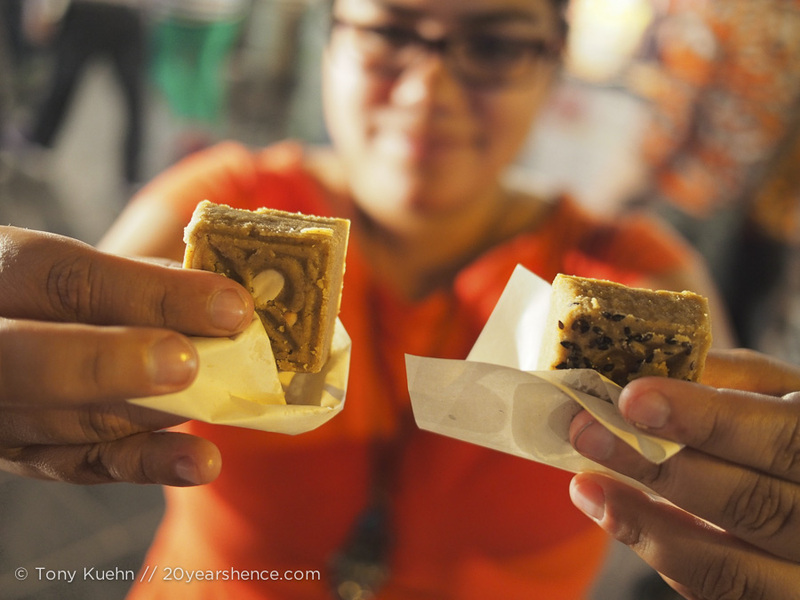 It was not just one of our best meals at the market, but one of the tastiest things we ate in all of China. We really embraced the spirit of the market with this dish, as we ordered it simply by pointing at the colored ticket that seemed most popular with our fellow diners, and then figured out the appropriate price by pointing at different numbers on the wall until we reached the correct one. We tucked into this utterly homey and exceedingly rich bowl of soup and knew with the first bite that facing our fears had paid off big time. For us, traveling means constantly challenging ourselves and taking risks, and although ordering unknown meals in China can be scary at times given the huge array of things they consume that we tend to consider inedible, it’s also been very exciting as well. Unlike Japan where we were very familiar with the cuisine and came in with a long list of dishes we knew we wanted to try, with China, we really came in with an openness to discover new dishes and without an eating agenda, which has proved to be very liberating. We also enjoyed a refreshing plum juice and a tea infused with dates. And since our sweet tooth still wasn’t satisfied, we then chowed down on a traditional bean dessert that honestly didn’t taste like too much, but that could also be because it was stickier than peanut butter and pretty much glued our mouths shut, which effectively put an end to our eating bender! Turned our mouths into a desert… dessert? It might have been for the best if our investigation into exotic edibles had ended then and there. Alas, now we enter the more regrettable portion of our eating adventures (and double alas, it won’t be the last time either). Following the recommendation of our guidebook, we headed to a restaurant called De Fang Chan for lunch following our outing to the Terracotta Army. We had read the specialty here was a multi-course dumpling banquet; for those not in the know, dumplings (or jiaozi as they are known in Chinese), are our culinary kryptonite. Unfortunately, like everything in China, we discovered the price had increased by 50% in the past two years, so we decided to forego spending $30USD per person and instead opted to order à la carte. Us: *Throwing our hands up in exasperation* Sure, why the heck not! One set of each! It was only after she walked away and we began to confer with one another about our order that we realized that neither of us really knew what half of what we ordered was. I had had a slightly easier time parsing our waitress’s speech, so was fairly confident that the third set of dumplings would be “four colors”, even though I knew that was not a flavor or filling. I also said that I had a sinking suspicion that “shugfain” may have in fact been “shark’s fin”. Look, we’re adventurous eaters. That much is clear. We pride ourselves on being fairly open-minded and there is very little that we won’t try at least once. But on our rather limited list of things we did not want to eat, there is shark. Because sharks are cool and from an ethical, ecological and environmental perspective, we don’t believe we should be consuming them, traditional medicine be damned. Half the time in China when I broke out my broken Chinese, people either pretended not to or made no effort to understand me. This time, my meaning was clear. The woman furrowed her brow and went back to the kitchen, then came back and shook her head. Resigned, I headed back to our table. 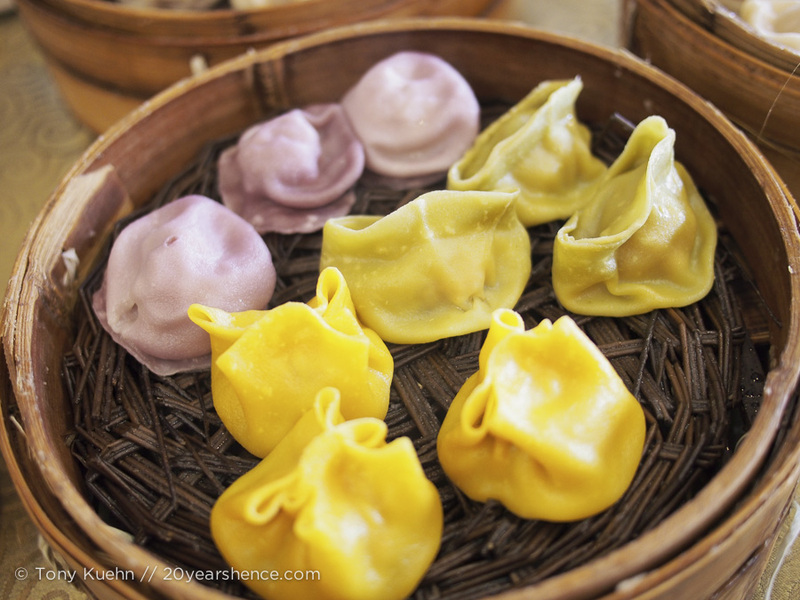 We waited to see if the shark fin dumplings had been canceled… When four bamboo steamer baskets appeared at our table, I knew I had been unsuccessful. We faced a dilemma: to eat the morally questionable dumplings or not? In the end, we decided that not eating the dumplings would simply be wasting food and serve little purpose. If these dumplings did in fact contain shark’s fin, the shark was already dead and our not eating them wouldn’t do anything to restore that balance. The best thing surely would have been not to order them, but seeing as we had done so, we figured we might as well just eat them. Biting into that first dumpling, waves of guilt washed over us. 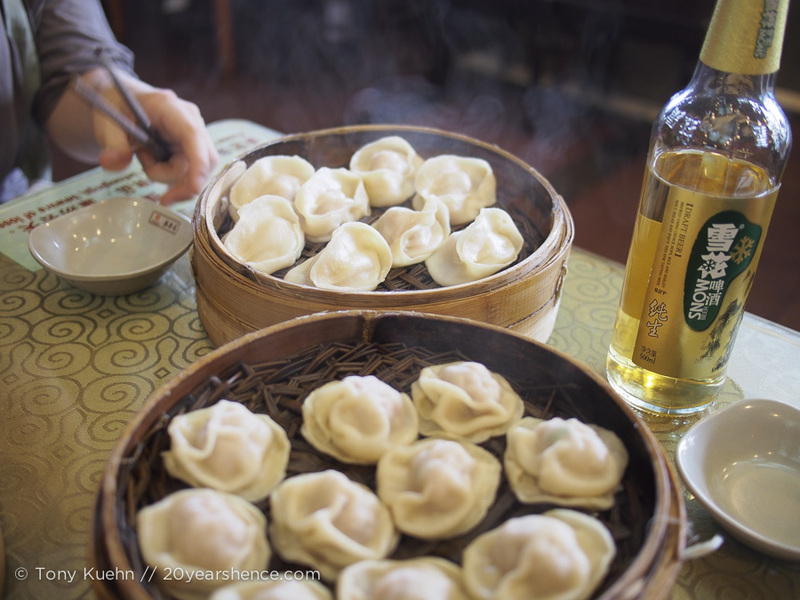 Because not only were we eating shark, but these dumplings were by far the best of the lot. It was clear to us why shark’s fin is considered a delicacy in this part of the world. 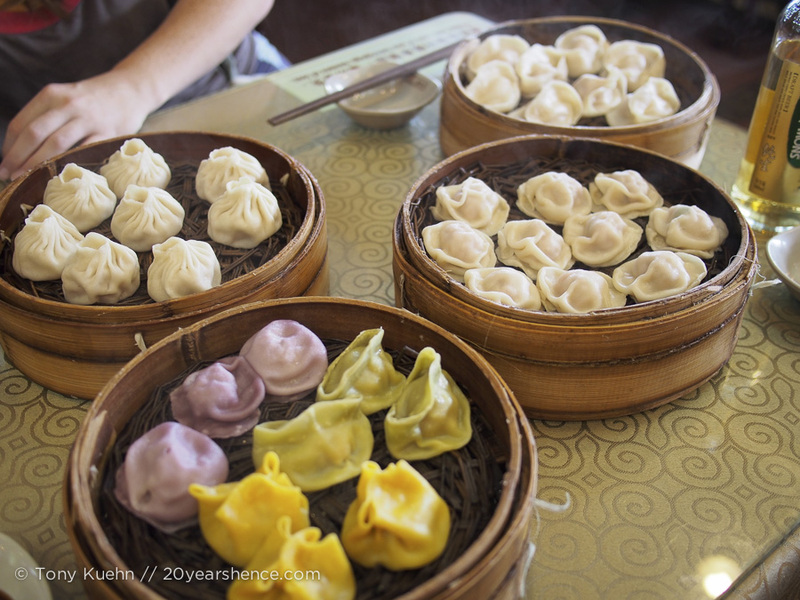 We savored each of those dumplings as we knew they would be our last. 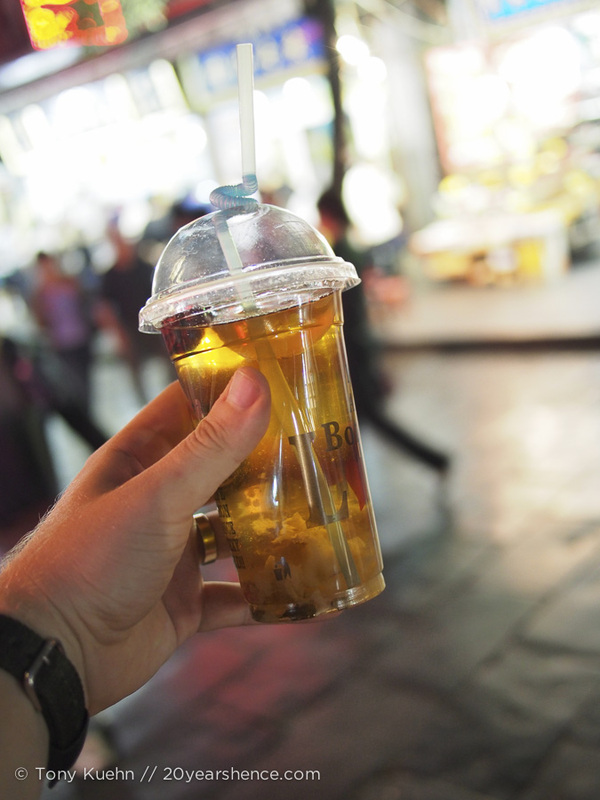 As a final meal in Xi’an — a city we had so quickly come to love — it was certainly fitting, equal parts bitter and sweet. 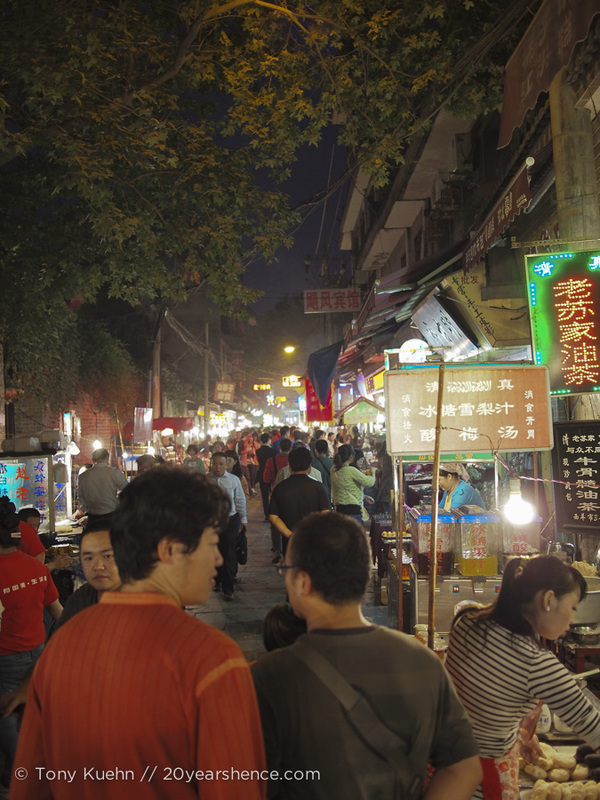 No matter how good those dumplings may have been, if we should ever find ourselves in Xi’an again, we know we’ll be sticking to Muslim street. Make us feel better: what’s the most ethically unsound thing you’ve ever eaten? I haven’t been that adventurous. Probably just foie gras or veal. Not that I eat either on a regular basis. I think there were some restaurants in Portland that were getting pressure to get rid of shark’s fin soup. We’ve been known to indulge in a little foie gras every now and then as well, though we do try to veer clear of veal for the obvious ethical issues. As newly minted SCUBA divers, we’ve been finding it really hard to enjoy eating seafood as we much prefer seeing these things under the water rather than on our plates. Plus, with sharks, there’s the whole issue of the ecological disruption that occurs when you start attacking the top of the food chain, so while eating foie gras may not make us feel great about ourselves, we don’t feel like it is ultimately as destructive (though our cholesterol levels might beg otherwise!) as eating shark. Yes, sometimes Japanese “delicacies” that we have seen have really made us anything but hungry! We once saw a food special that talked about how the freshest lobster in Japan is eaten while the lobster is still alive… that just seems unnecessarily cruel to us! I am sure I would have a hard time eating horse as well, especially if it didn’t taste good. Sometimes the mental block is just too much to overcome, but at least you gave it a shot and can say unequivocally that it’s not for you! I haven’t really eaten any ethically questionable food, but a friend and I just discussed scrapple over the weekend, and I told her that there ought to be a law against that sort of thing. She described it as ” crunchy on the outside, and oozy on the inside” when it was cooked, and I felt a little woozy! I am sorry about the shark, but that lamb soup looks like it was incredible!! But yes, despite our bad feelings about eating shark products, it’s nice to know that there are so many other delicious eating options while in Xi’an. As good as those dumplings were, that soup really was fantastic (and just a fraction of the price too!) and left us extremely sated but WITHOUT the guilty conscience! OMG you guys make the food look soooo amazing!! As for eating questionable items I take a somewhat ‘when in Rome’ approach. My personal preference is not to eat bugs or organs but outside of that I think I’m pretty willing. I figure that there are items in my N.American diet that others would not agree with and so I cannot cast an eye in another place at what they eat. I would have eaten the shark fin dumplings (although I would not have knowingly ordered them either) and I did eat horse sashimi in Japan (as part of a meal, not ordered…but I did like it!). We travel to open our eyes and sometimes that means stepping way out of our comfort zone. I think our eatiing philosophies are very much in line with each other: we respect that other cultures may have a broader (or soemtimes more narrow) definition of what is ediible, and we try to respect and embrace that as much as we can. As you know, we tend to be fairly open to at least trying foods made with bits that we might normally avoid (we’ve had our fair share of organs! ), but there are a few things we have said we will not eat: no nervous systems (read: no brains!). And of course it is all the trickier when you’re presented with foods that you find ethically unappetizing—I’d much rather eat intestines than be presented with a plate with whale or monkey on it. And dog would be a non-starter as well… let’s just hope it never comes to that! Xi’an food is the best in China! I’m getting hungry just reading this, I want to go back! Did you really like the tea with the dates in it? Maybe I was expecting something else but I thought it was horrible! Seriously, lambs are adorable, and yet the thought of never having a lamb burger again or gyro or anything else with their delicioius bits in it is too sad to ponder! I also feel the same way about pork – why must pigs be so adorable yet so tasty? Ahh you are making me homesick! We lived in Xi’an for 3 months and the food was absolutely the highlight. The mystery meat sandwich is lamb, it’s a specialty of the city. I really miss the lamb soup too, it was the perfect cold day meal. If you’re ever in NYC you can hit up Xi’ans famous foods in Chinatown and have another go at both! Ah, of course it’s lamb! That makes complete sense given the abundance of mutton in all the other dishes… And I had no idea Xi’an’s foods were so abundant in NYC. Next time we’re there, I’ll make an effort to check that out!